Jalandhar: Pulsing that the world is at great point of stir up for elaborate dialogue and experimentation to have creative solutions to challenges being faced by both developing and developed countries; the School of Arts & Languages at Lovely Professional University organized 18th APG (Association of Punjab Geographers) Meet and International Conference. His Excellency Ambassador of Republic of Mali to India Mr Samake Niankoro Yeah was specially invited to inaugurate the conference & the Meet, where 200+ papers were presented by eminent intellectuals, scientists and geographers from across India to solve out the problems being faced world over. 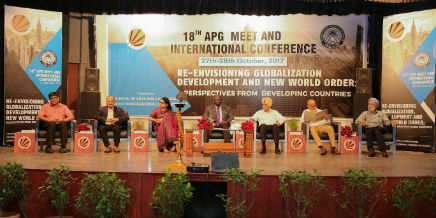 The comprehensive theme of the conference was ‘Re-envisioning Globalization, Development and New World Order: Perspectives from Developing Countries’. Upholding great spirit of Internationalism, H.E. Mr Ambassador also celebrated ‘National Day of Zambia’ along with African, international & national students of LPU. Former Chancellor of Central University of Punjab Padam Bhushan Dr SS Johl was the guest of honour of the occasion. Prof Gopal Krishan presented the keynote address. Taking example of the yester years’ USSR, Dr Johl emphasized that world is a great global village and no one can exist well by being isolated from the rest. Taking example of India’s great strength and survival during recession period, he emphasized that aloofness is no answer to an existence; change with the time makes the matter better. Every country ought to be strong enough to face any of the challenges as per its great global policies of openness. Dr Johl also appreciated the progress at LPU and referred it as the largest residential university. Putting forward policy implications for overcoming shortcomings of various processes of globalization 243 research papers were also presented for attaining sustainable development world over. Based on various findings, Prof Ateeque Ahmad (Aligarh Muslim University) provided feasible suggestions which may prove valuable for the future development of tourism in Jammu & Kashmir. Doctoral Research Fellow AR Kunnathodi from Centre for West Asian Studies discussed the commercialization of knowledge and global trends in higher education. 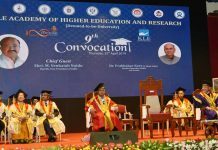 He has focused on academic mobility from global North to South and vice-versa and proliferation of branch campuses of western universities in the developing countries. He has also evaluated critically the emergence of knowledge economy and the subsequent western monopoly in the academia all over the world. Prof Dr Pavittar Parkash Singh of LPU discussed stubble burning and its impact on environment and human health. He hints that problem exists as there is little market or storage space for waste material from the crops; however, paddy straw can be used for paper and pulp board manufacturing and it can also be used for production of electricity. LPU student Ambika Chhetri explained how Bhutan became the first carbon negative country in the world and how much love Bhutanese have for nature, as conservation for environment is a duty for each and every citizen of the country. She illustrated that by planting hundreds of saplings in an hour in Thimphu, Bhutan has set the Guinness World Record in 2016. Similarly, another paper explained the South Korean culture and economic miracle which can be possible lessons for India in terms of GDP, Trade, Manufacturing, Education, Inflation, Corruption eradication, Research and Development.